This Sunpentown stainless steel rice cooker is a rare compact rice cooker that offers folks a true stainless steel inner pot for making a good quality batch of white rice without the concern of using Teflon or other non-stick coating. However, please note that this cooker is not non-stick and there will be some rice that sticks to the bottom layer. The Sunpentown SC-886 stainless steel rice cooker has a 3 cup capacity bowl that will cook up to 9 cups of cooked white rice, can also be used for preparing healthy steamed food, preparing oatmeal, for making stews & soups, sports an easy one lever design, and features a keep warm mode and stay cool carrying handles. First, let us state that this rice cooker uses a different kind of cooking method to prepare the rice. Usually, with a large percentage of rice cookers, the inner bowl comes in contact with a heating element that boils the water and cooks the rice. However, with this Sunpentown stainless steel rice cooker, there are two inner pots. From what we’ve gathered, the permanent pot housed inside the rice cooker needs to be filled with water before adding the removable stainless steel bowl prior to starting the cooking process. A layer of water separates the two pots from the heating element during the cooking process. This leads to a more evenly cooked batch of rice with minimum crusting on the bottom layer, (although there may be some rice sticking). 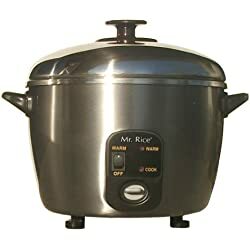 *For folks who own this unit…please advise us if the removable pot needs to be filled with water as well, or if the cooker uses purely steam to cook instead of boiling the rice in water. Clean up is easy by letting the pot soak in warm water allowing the stuck rice to soften and remove with ease. Just keep in mind that a couple of folks reported that rust spots tend to develop on the outside of the rice pot. This is no need to worry since they rub off easily and do not come in contact with the food inside the bowl. A couple of owners also stated that this rice cooker is a bit noisy when cooking since the two inner pots tend to vibrate between the boiling water. But this does not seem to be too distracting. Included with this Sunpentown stainless steel rice cooker is an instruction manual, stainless steel rice pot and serving paddle. We have found that many folks favor this neat little Sunpentown stainless steel rice cooker and love the fact that they can also prepare other food instead of just having a rice cooker. The only con with this particular model is that it is a bit too small for larger households and does come with a high price tag despite the cup capacity. However, this is due to the stainless steel pot and lid. Another thing to note is that unlike its competition, the Miracle Stainless Steel Cooker, this Sunpentown model will not boil over since it has a better sealed top lid design. At least we didn’t hear of any complaints of spill-over thus far.